Below are links to new posts since last week’s wrap up post. If you have one to add, either leave a link in the comments here, or I’ll include in next week’s wrap up. Great stories this week, everyone! I really enjoyed browsing through the posts! James at Ready When You Are, C.B. tries to find a connection between Isak Dinesen’s “The Dreaming Child” and George Orwell’s “Inside the Whale.” Will he succeed? Click below and find out. This equilibrium may have lasted years. May have. A catalyst for change is introduced, however, when one of the other employees (not from the twenty-six, but in a higher, “white bread baker’s” position) is fired and his replacement turns out to be a somewhat dashing former soldier. The former soldier wears a “satin vest and a watch with a gold chain” and, though a bit of a dandy, is friendly to the twenty-six (not condescending like the other white-bread bakers). In conversation with the twenty-six the soldier admits “How lucky I am with women, eh? It is very funny. Just a wink and I have them.” One can guess in what direction this story might go, no? The soldier’s successes thus far have been with the tawdry “embroidery girls” who also work in the building. Upon listening to the soldier boast of his conquests, the baker that supervises the twenty-six’s work is foolish enough to comment to him that, “You need no great strength to fell little fir-trees, but try to throw down a pine…” Suddenly Tanya’s virtue is threatened… Whether it’s a happy ending or not I won’t say. I will say that Gorky’s depiction of the workers’ condition and their psyche rang very true. 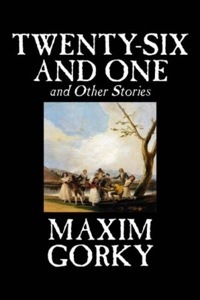 I also enjoyed reading the biographical info about Gorky in the introduction to my copy of “Twenty-Six and One (and Other Stories)” and learned a lot about him I didn’t know. 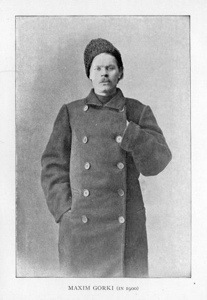 He lived a large part of his life as a “tramp” wandering from place to place, yet always “reading and studying feverishly.” It is said thatit fell to him “to write the poem of vagrancy” and that “…the introduction of tramps in literature is the great innovation of Gorky.” What about YOU? Have you read Gorky? What do you know of him,and which works would you recommend? 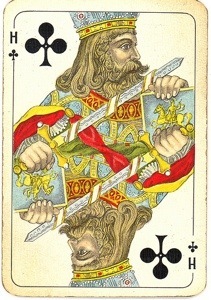 Clubs are a “special suit” in my 2014 Deal Me In Sort Story Reading Challenge, representing stories by Russian writers. In last year’s edition of the challenge, I read stories by Turgenev, Gorky, and Pushkin, which only whetted my appetite for more. 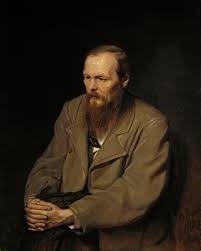 I’ve read a little Dostoevsky before, including the novels Crime and Punishment and The Idiot and also a short story (“The Grand Inquisitor?”) for my old book club’s annual short story month me year. One elder, however, callously invades the sanctity of the children’s world. 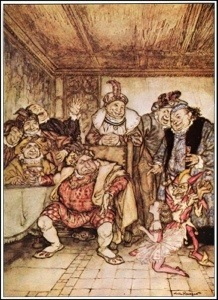 The narrator sees his motives clearly and even attempts to expose him to shame with an indiscreet comment. None of this derails the plans of the elder, though, as we learn at the story’s conclusion. What story did you read this week? Do you have any favorites from among Dostoevsky’s shorter works? Below are links to posts by participants that have been published since my last weekly wrap-up. (Most are participants’ 2nd short story but not all are – there is no formal deadline for when you read and post about your stories) If you wrote a post that I somehow missed, please let me know in the comments and I will promptly add the link in the body of this post. It also seems that a few who have signed on are treating the challenge as simply to read 52 stories this year. That’s fine too. I will still look for related posts from you and include in the weekly round-up. Mannomoi @ Dilettante Artiste is in the midst of TheBout-of-Books Readathon. She read P.G. 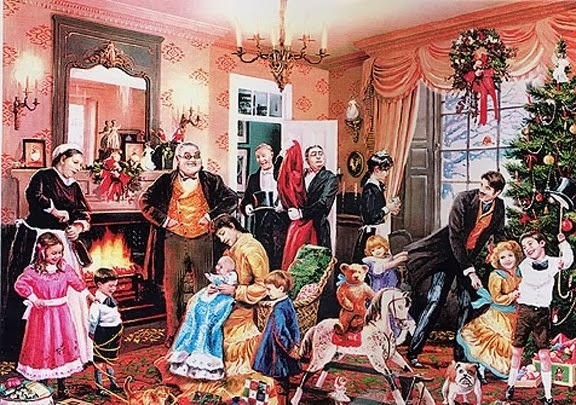 Wodehouse’s “Misunderstood” but I don’t think a post is up yet. The first two sentences grab the reader instantly and paint a vivid picture: “Alejandro’s knuckles sprayed backdoor glass across kitchen tile. His fingers twisted red on the doorknob and deadbolt.” Pretty vivid imagery, huh? Alejandro is addicted to crystal meth but, as chance has it, his latest victims are the family of a member of law enforcement, detective Mitchell, who later blames himself for not being home when the break-in occurred. Heap this on top of his already soured outlook on what life “in these parts” had come to in the past few years when “…everything had become tense. Meth had scourged the land. Made working-class folk less human. More criminal,” and you have a character ready to exact some brutal revenge. No punches are pulled in this story. The realities are harsh and violent, which makes it a hard story to like, but what’s not hard is appreciating the gritty and powerful writing. My only problem with it was that, in my opinion, the plot of this particular story itself didn’t seem up to the level of the writing. It’s a relatively basic story of revenge but not much more. Still, I’ll be reading the rest of the stories in the book at some point. What short stories did YOU read this week? 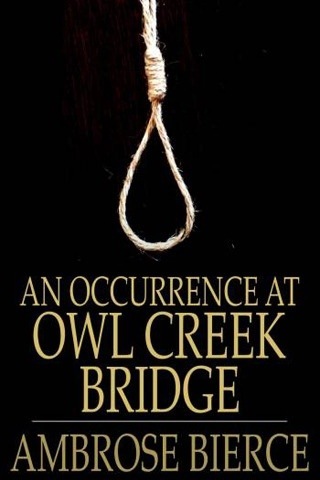 Had you heard of this author before? (I hadn’t until a couple months ago) Were you also a fan of Breaking Bad? 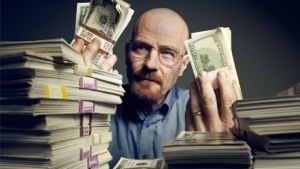 Below: Bryan Cranston would never have made that kind of money as Jerry’s dentist on “Seinfeld” would he? 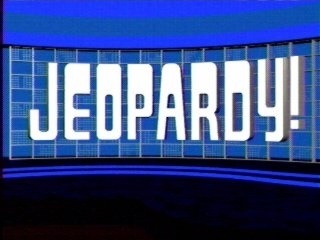 This Tuesday, Wednesday & Thursday mark the latest round of the online tryouts for the TV game show, Jeopardy! As a lifelong triviaphile and someone who now and then is blessed with episodes of ’Rainman’ memory, I’ve tried out twice before, making it “all the way” to the contestant pool both times. I was never called up to the show, though (I did the math once and figured the size of their contestant pool might be ten times the number needed, so even if you make it “all the way” in their audition process, it’s still a bit of a lottery). So, someone was kind enough to post the 50 questions (and answers, which I’ll share below) on the show’s online forums last night. 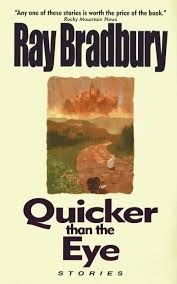 As in prior times I’ve taken the test, books and literature comprised a significant percentage of the questions. I’ve bold-faced the ones that had a book or literary component below – quite a few, eh? I scored comparably to the last time, which resulted in an invitation to the in-person phase of the audition, where you have to take another fifty question test, be photographed and interviewed, and play an abbreviated version of the game with two other candidates. Take a gander at the questions and see how many you know. (I’ll post the answers “below the fold”) Sony Television is very cagey about sharing how many you have to get right to “pass,” but based on prior experience I suspect it’s at least 35 or maybe as many as 40. 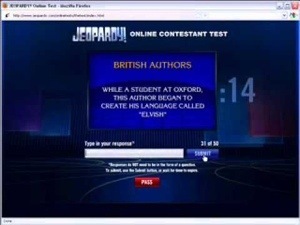 When you take the test online, you only have 15 seconds to type in your answers. Pressure! Have you ever tried out for Jeopardy!? What was your experience like? Do you watch the show? How many of the “bookish” questions below did you get? Claire Danes plays the Emmy-winning role of CIA agent Carrie Matheson on this Showtime drama. 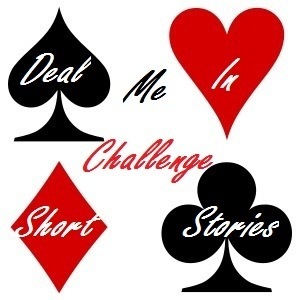 As I noted in the sign-up post, I’ll be posting a weekly update for the Deal Me In Short Story Reading Challenge. I’ll try to do these regularly on sunday evenings, and will include links to what others have posted since the last update. I’d also like to thank Mannomoi at Dilettante Artiste for upgrading our unofficial logo (pictured above) for this challenge. I love it! Feel free to use it in your weekly posts if you’d like. These are the posts I found as I went to press with this post. If you finished a post on another story for your week one, you can also link to it in the comments to this post. So, we’re off and running with DMI2014! As I said I’ll be doing a kind of round up post on Sundays. We’re a small enough group I can probably just manually do these posts with the links. If you’re a regular reader who’s not taking part in the challenge, please consider visiting some of these other blogs written by fellow fans of the short story. 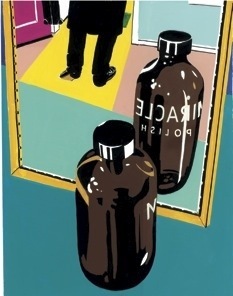 Though the narrator is by all accounts a fully rational man (“I wasn’t the kind of man who looked at himself in mirrors. 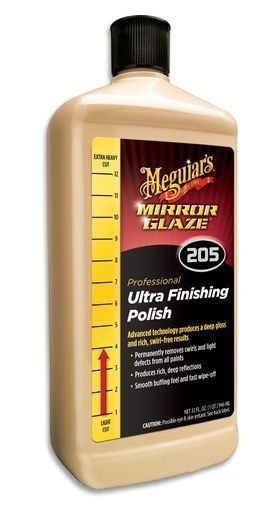 I was the kind of man who spent as little time as possible in front of mirrors, the kind of man who had a brisk and practical relation to his reflection.”) he notices something strange when he first uses the polish to clean a smudge on a mirror. Realizing that now the REST of the mirror looks dull, he cleans the whole thing. That’s when the fun begins. Predictably, things cannot go on this way,and the story reaches a disturbing(?) climax. At least I thought it did. Others may feel differently. I also got the feeling while reading that the story would be easily adapted into a script for the old Twilight Zone series. 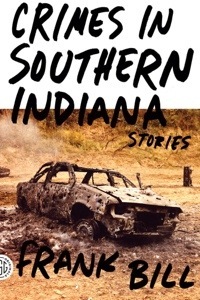 In the “Contributor’s Notes” section of my book, Milhauser himself says of this story: “I was seized by the desire to write a mirror story, but that was as far as things went. Every possibility seemed boring or frivolous. I turned my attention to something else. One day it came to me: the mirror shouldn’t be a gateway to a fantastic world, but should behave very quietly. 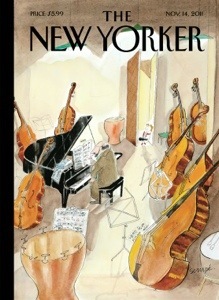 This thought, or instinct, propelled me to this story.” Nice. What about you? Have you read anything by Steven Milhauser? What do you think of him? 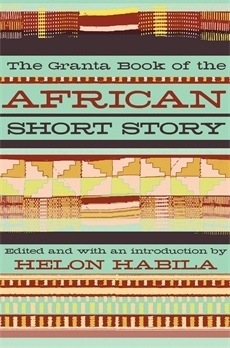 What short stories have YOU read lately. 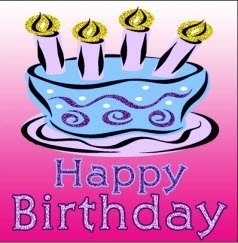 I almost forgot my blogoversary, which was January 2nd. I had no idea how long I would be doing the blogging thing when I started on 1/2/2010 and, frankly, I’m kind of surprised I’ve kept at it this long. I guess the obvious reason is that I’ve kept it up because I have found the experience so rewarding. I’m also closing in on my 500th post, with 496 already published (well, 497 if you count this one) and #498 scheduled for tomorrow. I’ve read over 200 books and probably more than 300 short stories during my blogging era, many of which I’ve discovered via fellow bloggers. So, a hearty “thank you” to all who follow me or read my posts – and especially those who take the time to comment. I hope I’ve been able to – at least occasionally – return the favor and lead you to some great books or stories that you might not have otherwise discovered. Here’s to another great reading year at Bibliophilopolis! 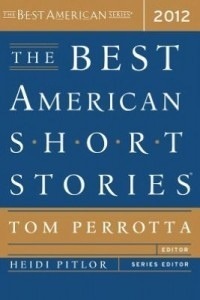 “The Shorties” my 1st Annual (ha ha) awards for short stories I’ve read. Now that my 2014 version of my annual short story reading project is getting underway, I thought I’d take a moment to reflect on stories I read in 2013, and recognize those stories and characters I now count among my favorites. 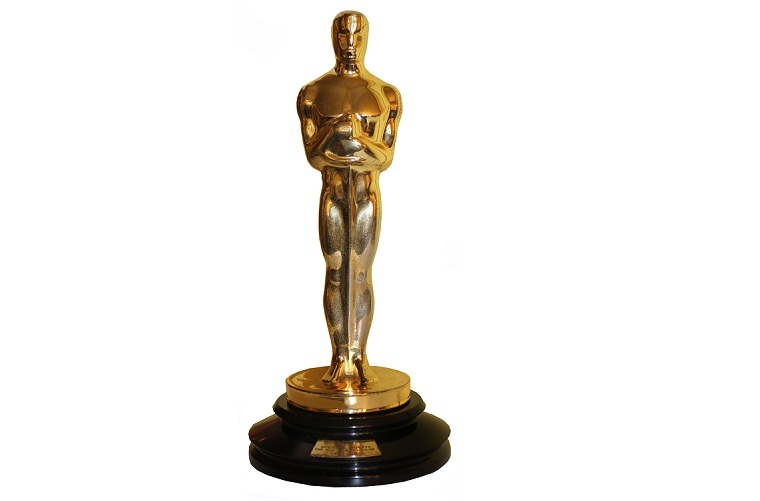 All nominees are worthy, so my winners a more a matter of taste than anything. I’ll have to go with Steven Milhauser. His story “Phantoms” was such a unique look at the possibility of ghosts and so wonderfully written I still think about it often. I’m a sucker for stories of resilient young people, so I’m going to go with the main character (I believe she’s never named) in Claire Keegan’s “Foster.” She adapts to her circumstances and “gets it.” Her thought near the end of the story where she “realized it was my perfect opportunity to say nothing” gave me goosebumps. I liked young Joe from Hemingway’s “My Old Man.” Another resilient youngster. Take away everything he’s got, but he’ll still be okay. Those are some of my favorite stories read during the past year. What were some of yours?